Global Beer Stabilizers Market size was valued at over USD 47,500 thousand in 2017 and is anticipated to grow at over 5% in the forecast timespan. Necessity to enhance alcoholic beverages to keep them chemically stable and with extended shelf life will be a key impetus for the beer stabilizers market. Compatibility with extreme temperatures coupled with haze & turbidity removal properties will propel the business expansion. Rising consumer inclination towards less alcohol content beverages due to rising health concerns associated with calorie intake through alcohol will stimulate the industry size. Shifting consumer preferences towards taste & quality over the quantity will augment the global market growth. Growing manufacturers’ focus on improving their production capacity for catering surging young population demand for craft beer will provide positive outlook for product penetration. Further, key features including improvised quality, enhanced taste, and rich aromas will drive the product landscape. For instance, as per the recent FoodBev report, in 2017 global alcohol consumption grew by 0.01% or 3.5 million nine-liter cases. Upsurge in the usage of regenerable polyvinyl polypyrrolidone by the large-scale brewers owing to the key features including reusability in the manufacturing process, cost effective, and convenient usage will propel the beer stabilizers market growth. In addition, major beer producing countries such as U.S., Germany, France, Brazil, Mexico, and Spain owing to the rapid innovations in the craft brewery segment will further provide a positive outlook for the product portfolio. Favourable government guidelines & regulations pertaining to the alcoholic beverages consumption will support industry expansion. As per, FDA regulatory norms in the Code of federal Regulations Title 21, part 173, subpart A, section 173.55, Polyvinylpyrrolidone (PVPP) can be used as a clarifying agent in alcoholic beverages and vinegar, followed by removal with filtration. FDA has set limitation as a clarifying agent at residual level shall not exceed 10 ppm. Hence, the regulatory guidelines provided by the FDA will foster opportunities for the beer stabilizers market growth. However, factors such as continuous cost for single use of stabilizers, deterioration effects on the filter life cycle, and high machinery & equipment costing may hamper the beer stabilizers market growth. PVPP/R-PVPP segment is projected to surpass over USD 2,400 thousand up to 2024. PVPP is primarily used in the treatment processes of alcoholic drinks for haze removal and polyphenols adsorption that causes turbidity in it. Key benefits such as high effectiveness at low dosage rates, short contact time, promotes maximum shelf life, no adverse effects on flavour, foam, and quality of alcoholic drinks, and eco-friendly nature will boost the product scope in the beer stabilizers market. Silica gel accounted for over 33% revenue share in 2017. Silica gel is among the major stabilizers used in the brewing process for the removal of haze protein fractions by the selective absorption method. 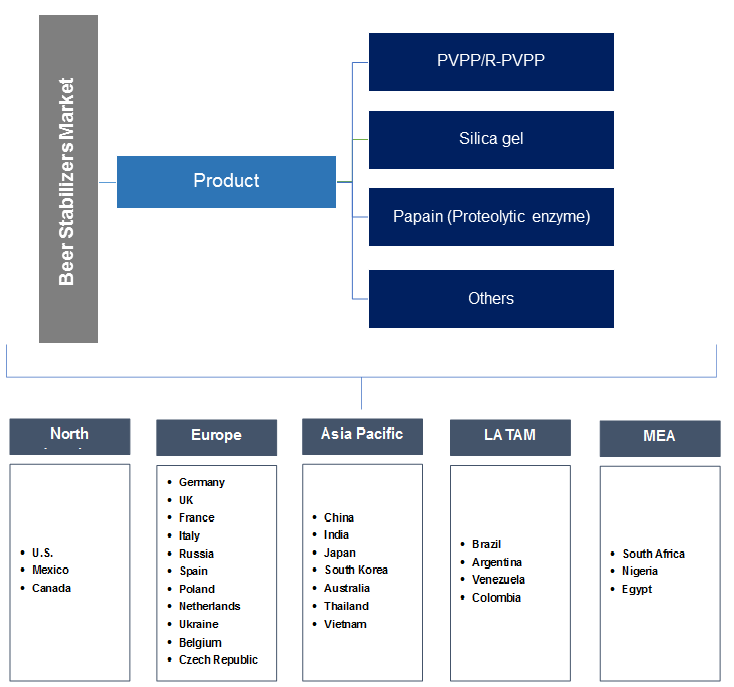 Major properties including increased stability of the liquid by removal of the protein & protein tannin compounds, PVPP compatible, resulting lower filter differential pressure, and adsorption of hydrophobic foam polypeptides will propel the overall demand of silica gel in the beer stabilizer market. Papain market will witness gains at CAGR over 5.6% in the forecast period 2018 to 2024. Papain is primarily derived from the Carica Papaya latex and is an effective method of complexing protein haze precursors and precipitation of the tannin protein flocs which is removed from beverage. 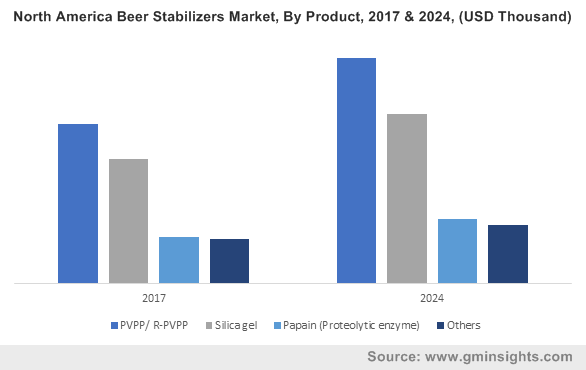 Key features including the ability to remain inactive by the pasteurization process, longer active state in the beverage, and easy digestion of dissolved proteins will escalate the overall beer stabilizers market. Asia Pacific market revenue is anticipated to surpass USD 21,000 thousand till 2024. Key properties including pH control of the brewing water, maintaining the solubility of sugars, proteins, and salts, shelf life enhancement, reducing the haze formation, and prevention of re-fermentation will provide a positive outlook for the beer stabilizers market growth. In addition, increasing stabilizers usage among the brewers owing to the rising consumer demand for new flavours & variants will propel business expansion. Moreover, rapid emergence of the new craft drinks producers, particularly in India, China, and Japan will further support overall product penetration across the region. Europe will witness CAGR at over 5% in the forecast period 2018 to 2024. Increasing consumer spending capacity and rising consumer preferences for alcoholic drinks owing to the availability of several variants with different tastes & textures will boost the beer stabilizers market size. For instance, as per the Food Navigator report of 2017, 64% in Poland, 63% in France, 61% in Italy, and 50% people in Germany preferred for new varieties in the market. In addition, rapid technological advancements & innovations in alcoholic drink manufacturing processes particularly in Germany, France, and Czech Republic will further accelerate the business growth across the region. Global beer stabilizers market share is highly fragmented with numerous global players along with few regional manufacturers. The major players include Ashland, Eaton, AB Vickers, PQ Corporation, and W.R. Grace and Company. Mergers, acquisitions, joint venture, strategic partnerships, and new product development are among the major strategies adopted for industry expansion by the manufacturers. For instance, on 17 April 2017, Ashland acquired Pharmachem Laboratories, which is a leading international provider of ingredients to global wellness & health industries and products to flavour & fragrances houses. The acquisition provided numerous growth opportunities in the high-margin end markets coupled with strengthening of their specialty product portfolio. Other prominent players present in the industry are Gusmer Beer, AEB, SINCHEM, Lehmann&Voss&Co, BASF, QINGDAO MAKALL Group, and ERBSLOH. Beer stabilizers properties vary according to the product type, including PVPP, silica gel, papain, and other products. Natural sources of the products including fruits and rocks differ in functional & operational properties. Increasing usage in brewing processes owing to the rising product variants demand, including craft-based drinks among young population across the globe is anticipated to support the business expansion. Shifting consumer preferences towards low or alcohol-free beverages owing to the stringent government regulations and several traditions & customs in different cultures across the globe pertaining to the alcohol consumption will enhance the industry landscape.